Trim candle wick to 1/8” before lighting, and keep wick trimmed to 1/8” while burning. 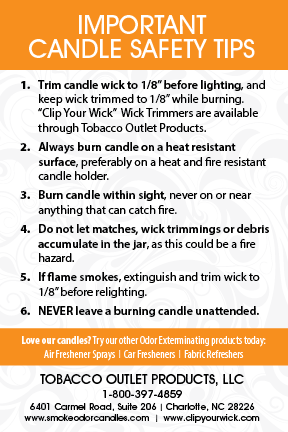 “Clip Your Wick” Wick Trimmers are available through Tobacco Outlet Products. Always burn candle on a heat resistant surface, preferably on a heat and fire resistant candle holder. Burn candle within sight, never on or near anything that can catch fire. Do not let matches, wick trimmings or debris accumulate in the jar, as this could be a fire hazard. If flame smokes, extinguish and trim wick to 1/8” before relighting. Burn candle within sight, never on or near anything that can catch fire. NEVER leave a burning candle unattended. Keep burning candles out of reach of children and pets, including birds. Always burn candles on a heat resistant surface, preferably on a heat and fire resistant candle holder. Burn candle in an area away from flammable materials, free from drafts and not near any other heat sources. Keep candle wick trimmed to 1/8” at all times. “Clip Your Wick“ Wick Trimmers are available through Tobacco Outlet Products. 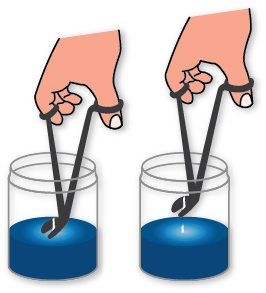 Make sure the candle wick is centered and the flame never touches the glass. To reduce possibility of smoking or sooting, keep wick trimmed to 1/8” at all times. If smoking occurs, extinguish candle, re-trim wick to 1/8”, remove any trimmings or debris and relight candle. To extinguish flame, place the metal lid over the jar, as this will minimize smoking. Should the jar become blackened, extinguish flame, allow candle to cool, and wipe inside of jar with a paper towel to clean off residue. Burn candle until ¾” of wax remains and discard, as glass may shatter. Do not refill jar with wax. Glass jars are fragile, so handle with care. Do not use jars that are cracked, chipped or scratched. Wax may be left on the sides of the jar after burning. To minimize this, burn your candle 3-4 hours at a time, until surface is completely liquid. Some wax may still remain, and this is normal, and the amount varies with candle color, fragrance and the burning environment.